Featuring Marco Banco who once crushed the 6 strings of hell in the legendary Blasphemy, Vancouver, BC’s Tyrant’s Blood do their country’s long heritage of waring death metal proud with their 3rd full-length, Into the Kingdom of Graves. Intensity teetering on the brink of chaos, Tyrant’s Blood erupt with fury on the leadoff track, Spiral Sea. Time changes and a hammering attack fein the passing thought of scattered recklessness musically, but after 3 listens to this song in a row, the band is so in synch with each other, the performance is quite remarkable. This is what I noticed first… a destructive and busy sound with an audible bass grit, and then the songs began to rise from the firestorm as something to be behold. 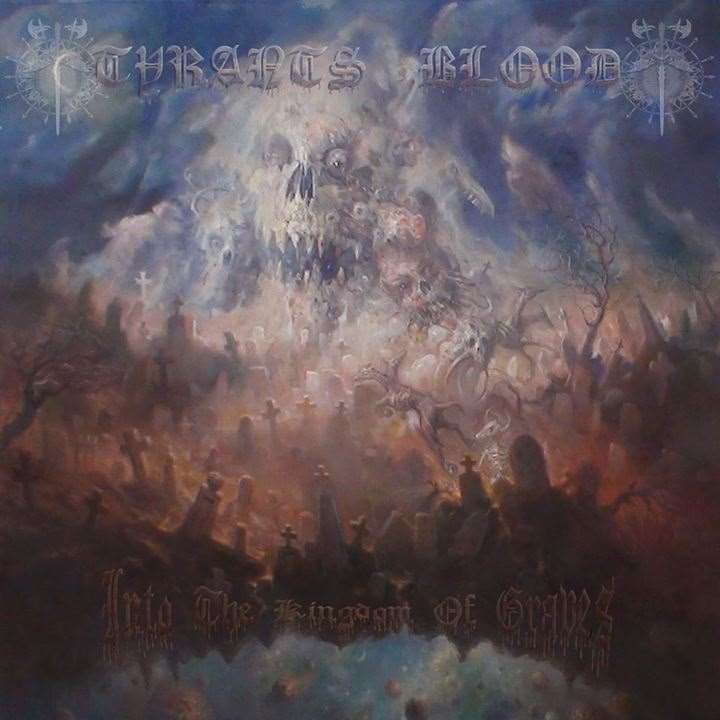 Orthodox song structure isn’t a concern in the world of Tyrant’s Blood which does make this material a bit difficult to hang onto, but the orchestration is so ravenous, it’s hard to turn away from the carnage. That and the fact that the riffs themselves are technically interesting, if not completely insane. Devoid of melody and light, Disowned and Defiled is a perfect example of intricate sonic butchery. Where bands like Revenge and Blasphemy possess a simplistic foundation musically, but gnaw and blitzkrieg with insane blasts sonically, they have established a style where many have blindly followed. Tyrants Blood are definitely within that war metal bunker stylistically, but their songs are far too complex to be lumped in with the knuckle dragging hammer attack of their fellow countrymen. Plus Tyrants Blood offer moments of reprieve as on Revelation in Damnation where slower riffs creep in to keep the motion forward thinking and bleak before detonating with a crippling riff assault. The fact that each of the songs on this release are longer and structures largely linear, it is impressive to comprehend that there could be at least 400 riffs on this album. Perhaps this is an elevated guess, but you will indeed feel winded after listening to Into the Kingdom of Graves. Bassist/vocalist Vinnie Borden’s vocals fit perfectly with this band for he possesses a demented barking style (there’s no other way to describe it) that centers on a low to mid-ranged register, but he so effortlessly reaches up through the carnage with sharper screams for variation. There is a lot going on here and because of this I found myself completely entertained and trained on the music as my brain attempted to process the method to Tryrant’s Blood’s obvious madness. ~ by martyworm on October 16, 2013. Great review and impressive musical assault by these guys— I bought the album during the course of listening to the song you posted. Although I have an infrequent need for war metal, Tyrants Blood sounds like a possible pinnacle of the genre if they maintain this quality throughout the album. This entry was posted on October 16, 2013 at 3:00 pm and is filed under ALL REVIEWS, T-reviews.You can follow any responses to this entry through the RSS 2.0 feed.You can leave a response, or trackback from your own site.